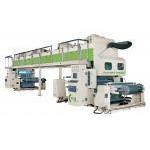 Wet Laminating Machine (FLM-WET) - HCI Converting Equipment Co., Ltd. Wet Laminating Machine Suitable for laminating all types of paper, film, and aluminum foil, such as, cigarette box wrapping, lunch and cake boxes, and etc..
Lift-up & fixed type unwind stand with 3" air shaft. The unwind tension is sensed by load cell and compared to the set tension. The control system will increases or decreases tension according to the calculated the tension difference automatically. Steel coating roller incorporated with pressurized rubber roller assures extremely uniform coating thickness and surface smoothness. Glue tank with pneumatic ascend/ descend device. Equipped with pneumatic laminating pressure roller ensure the laminating quality. The motor speed and tension are synchronized in motion which improves laminating quality and stability. Four zones and straight dryer provide superior drying performance. 3 different options of drying: Electric heating & Thermal oil & Gas heating. Tension problems during the drying process are eliminated by use of the micro location offset via dancing roller control systems, which allow for foil (6 micron) to laminate with other various films. It provides the most stable tension even the material has passed through the dryer and been affected by the temperature. Equipped with auto temperature controllers and waste gas exhausted disposal system. All rollers are driven by chain preventing from material scraped. Rewind is driven by motor providing the most accurate control. LCD colorful touch screen and simple figure display for setting. Unwind & drying & rewind tension auto control. Meter reached auto stop function. Unwind auto stop and material exhausted stop function. Center guiding type web guider. 1 color printing device including waste gas disposal system. Unwind Core Inner Diameter (mm) 76 / 3"
Rewind Core Inner Diameter (mm) 76 / 3"